In a close contest against the America East Conference-leading Albany Great Danes, Stony Brook Volleyball suffered its second straight conference loss in four sets on Friday in Pritchard Gymnasium. The team dropped to fourth in the America East Conference standings and will need to win on Sunday to make the playoffs. Both teams performed well on the attack to begin the match. Neither team had the advantage in the first set, and both sides traded kills throughout. Eventually, Albany broke through and went on a 5-1 run, which forced the Seawolves to call a timeout. The Great Danes were unable to be stopped, winning the first set 25-22. The second set was also highly competitive on the attack. The Seawolves capitalized off a service ace by sophomore outside hitter Maria Poole to take a 16-12 lead. Stony Brook looked to close out the set with a four-point lead, but an Albany timeout sparked a 12-5 run for the Great Danes, allowing them to take set two 25-21. Belzung recognized the struggle her team was facing along with what needed to change in order to make a comeback. Up 2-0, the Great Danes began to make mistakes in the third set. The Seawolves scored four straight points off errors in the middle of the third set to take a 13-9 lead. Albany overcame the deficit and retook the lead, but consecutive blocks by Stony Brook sophomore outside hitter Jordan Gels and sophomore middle blocker Kendra Harlow gave the Seawolves a 25-23 victory in set three. Although they dropped the previous set, the America East Conference leaders rebounded by finding holes in the Seawolves defense. Albany redshirt-sophomore middle blocker Akuabata Okenwa, who led the team with 15 kills, scored back-to-back kills and recorded a block to give the Great Danes a 12-9 lead they would not relinquish. Albany would end up winning the fourth set 25-14 and the game 3-1. Stony Brook is currently tied with UMBC for fourth place in the America East Conference with a 6-5 overall record. With a victory in their final regular season game against Binghamton and a UMBC loss at New Hampshire, the Seawolves can capture the fourth spot in the conference tournament and potentially rematch first-seeded Albany in the opening round. 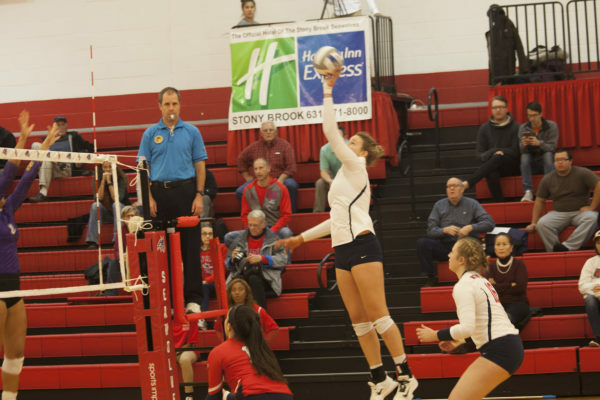 Stony Brook will wrap up the regular season against Binghamton on Sunday, Nov. 12 at 1 p.m. in Pritchard Gymnasium.